Get your Briarcrest Neighborhood yard sign! Briarcrest is a mostly residential neighborhood in southeast Shoreline, Washington. The boundaries are NE 145th St. on the south to Bothell Way NE on the east (from 145th St. to 150th St.), north along the west border of Briarcrest Elementary School and then on various streets along the border with Lake Forest Park to NE 168th St. 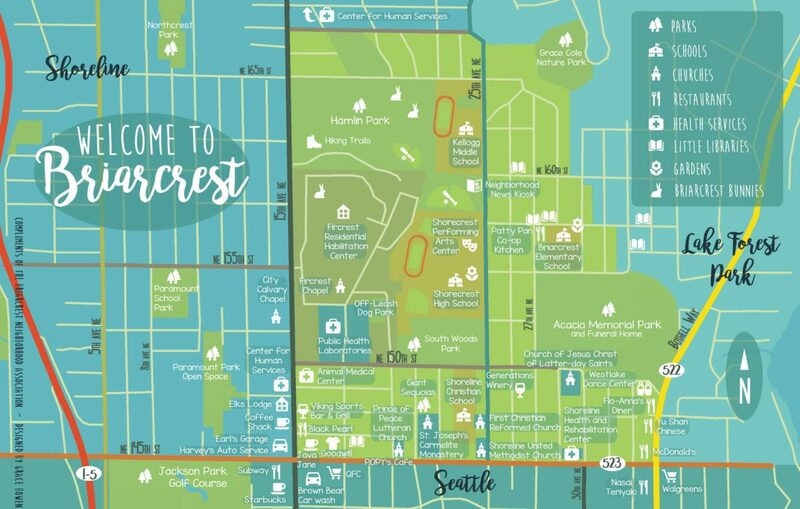 The farthest-north extent is NE 168th St. On the west, the neighborhood is bounded by 15th Ave. NE from NE 145th St. to NE 150th St., east on 150th, and then north on 25th Ave. NE to NE 168th St. Briarcrest has approximately 2,500 residents. Our mission is to promote community, serve as a representative voice of the neighborhood, foster dialog and action, and offer opportunities for public service.